We're sorry, this product is no longer available. Try the upgraded Korg AW-LT100V Clip-On Tuner for Violin / Viola. 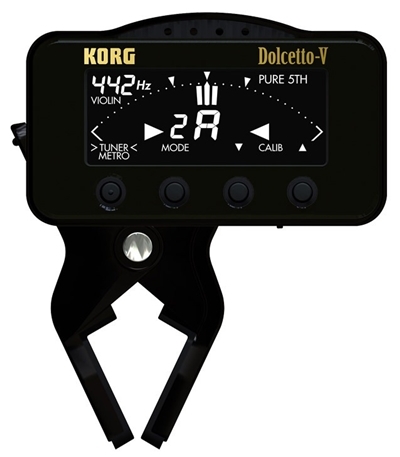 The latest tuner in Korg's line of flagship tuners has arrived: the Dolcetto V, for violin and viola. Providing the high precision and sensitivity that you expect from Korg, Dolcetto-V uses a newly designed clip that firmly attaches to the peg box of a violin or viola. There's also a transpose function and a new type of display that's designed for high visibility and operability. . Besides conventional chromatic mode, violin mode and viola mode are also provided. The Dolcetto is the new standard for all clip-type tuners to follow.